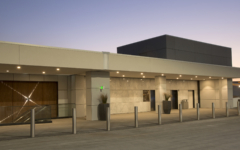 The new 2,000-space Monroe Parking Garage is located at the upscale Westfield Valley Fair shopping mall in the heart of Silicon Valley. 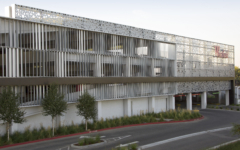 The parking garage design includes an aesthetically pleasing modern façade featuring vertical metal louver fins and metal panels patterned with laser-cut circles of various sizes. 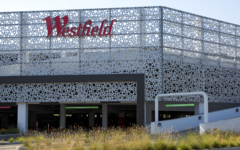 This façade treatment connects the parking structure with the quality of elements that are part of the overall mall experience. A modern aesthetic landscape surrounds the garage with drought-resistant plantings and decorative rock. 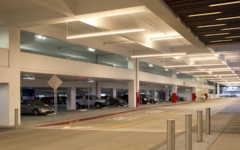 Vehicles can access the main garage entrances at one of three points and then circulate to the upper levels quickly via express ramping systems at either end of the parking structure. Designed to facilitate “smart” parking, the structure includes a state-of-the-art parking guidance system, effectively guiding patrons to available parking stalls. Typing in a license plate number at a nearby kiosk immediately locates a forgotten parking spot. Other amenities include bicycle and motorcycle parking, electric-vehicle charging and complimentary Wi-Fi.